At the order of Edward I, John de Breton, Bishop of Hereford (1268-1275), compiled tracts of English law in French. One of the greatest medieval English lawyers, John de Breton produced the work about 1275, just before his death. His legal compilation was part of the programmes of the king, one of whose most important accomplishments was his legal reform. John de Breton's book is written in French, the language of the Plantagenet king and the nobility. This manuscript copy of it is decorated in a general, contemporary style, the animals and scenes adding an entertaining and slightly luxurious note to its borders rather than having any relation to the text. In it an inscription states that it belonged to the small Cistercian Abbey of the Blessed Virgin Mary, at Merevale, near Atherston. 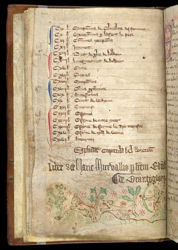 In a blank space beneath the list of chapters of the book, the inscription recording the abbey's ownership of the book appears in large letters with the name of brother Edward Brantygthorp. In the lower margin, a hunter pursues a large rabbit-like beast.